The fairy #Neuschwanstein castle in #Schwangau, #Germany . 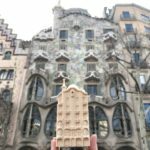 Wonderful First #3DPrinTravel of 2017! Model taken from #Thingiverse and #3Dprinted using my #fabtotum with #monumental filament by @treedfilaments. Hand and handpaint by @saudadinhas. Up there in the Alps there is a white and turreted castle, which seems to belong to a fairy tale. It is the castle of Neuschwanstein, built between 1869 and 1892 by King Ludwig II of Bavaria. Unfortunately for him, he lived here only for a few months and could not even see it completed, since he died in mysterious circumstances in 1886. The visual impact with the castle is very strong: it stands out as a bright crystal against the black shadow of the mountain. We saw it with the sun and the snow in one of those icy days that freeze your breath. It was so beautiful and elegant, clinging to the rock.. Distant and yet familiar, since it has been part of our imaginary ever since, from the time of our childhood and afternoon Disney movies. Its forms are in fact those that inspired Snow White, Cinderella, and the Sleeping Beauty Castle. This is the original and yet a reproduction itself: a cliché of the Middle Ages recreated on a steep mountain by a crazy and lonely king, a dreamer’s refuge.